We are inviting all our supporters to send a Christmas card to their MPs and Police & Crime Commissioners this year, and we have written a text for you to put in it. For more information on how to do this go to our Christmas Card campaigns page. Imagine your MP opening this letter this Christmas – we hope it will make them sit up and think about how they should support the calls for an open and full inquiry into the truth behind the undercover policing scandal. And if they don’t, who are they sitting down with? 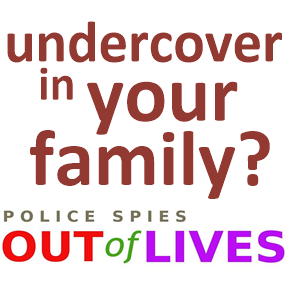 “This winter, as you gather around the table with your family, what would you do if one of the people at your table wasn’t who they said they were? What if they were an undercover police officer? What if they viewed their long-term sexual relationship with you or with a female member of your family as a ‘perk of the job’? What if they were planning to falsify a nervous breakdown in the coming months, hoping to create a trail of worry and confusion in their wake, for all those who are currently sitting at your table? What if they’d used the identity of a dead child for their false name and date of birth? Somewhere out there, there’s another family gathering together, still grieving, while unbeknownst to them their loss is being exploited. What if the officer was handing names of those around the table to an illegal blacklist – meaning that in the coming year someone amongst your nearest and dearest is forced, mysteriously, out of employment and into poverty and anxiety? What would you do then? And what if the excuse given for all this is something precious, and important, that we should all be able to take for granted: political activity. Normal, everyday, political activity. What would you do then? What if the ‘political activity’ that prompted this so-called ‘infiltration’ covered every kind of issue and difficulty currently facing society? And particularly, what if it was challenging police corruption? Or police racism? Or police violence – even homicide? What would you do then? What if the officer wasn’t having to collect information for a prosecution, wasn’t having to conduct proper investigation, but was just ‘intelligence gathering’ for the gratification of their bosses? Or what if there *was* a prosecution, and the officer was present at confidential legal meetings? What if they were prompting people to break the law, or even commit acts of violence? If you found all this out, wouldn’t you be jaw-droppingly appalled? Wouldn’t you think that it was ESSENTIAL that the police unit be halted, their records secured, and that those responsible for these gross actions be brought to justice? Wouldn’t you feel it was a matter of public urgency that the truth be understood, and that this deeply appalling police culture be challenged and deconstructed? Yet over the last year – despite all this having actually happened, despite these abuses being dragged into the public eye by those the police have abused the most, despite the profound threat to democracy that the unit’s actions represent – over the last year the police have strenuously attempted to keep their actions hidden in silence. And the Home Office has backed them. If you are not making a fuss about this – challenging the Home Office, insisting on disclosure and justice, pushing that the Pitchford Inquiry into Undercover Policing be fully effective, then what are you allowing to continue?